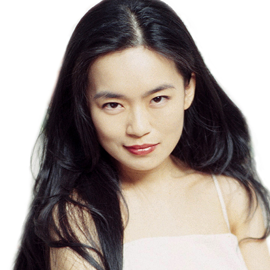 Pianist JUNG LIN has been acclaimed for her poetic and virtuosic pianism. A native of Taiwan, she conducted her own orchestral works at age 12, won numerous competitions in her native country, and was featured on Taiwans major news program 90 minutes. At sixteen her symphonic poem, The Black Wedding was given its premiere by the Juilliard Symphony under Miguel Harth-Bedoya. While at Juilliard Ms. Lin studied composition with the renowned American composer David Diamond, and for six years, piano with the eminent pianist Martin Canin. Jung Lin is an avid champion of Nikolai Medtner, she is set to release the complete Tales for Naxos. Ms. Lin was invited by radio station WQXR to perform many recitals at the New York Botanical Garden and The Metropolitan Museum of Arts, playing to capacity audiences and worldwide on wqxr.com. Her recent New York appearances have included Alice Tully Hall at Lincoln Center, Bargemusic, the Kosciuszko Foundation, and the International Keyboard Institute and Festival. She lives in New York City.